Timely, Reliable, Accurate, and Complete information in Business Intelligence reports enables fact-based decision making. These will lead to increased profitability. An Application Data Management (ADM) tool to replace or augment an MDM tool. If you are unfamiliar with ADM, then it is a tool that has MDM capabilities, with out of the box real-time integration, with applications like ERP or CRM. While both options empower users to trust their data and spend their time on operations and not on integrating and fixing data, option #2 is more economical. MDM programs will deliver business value only when viewed from the context of the applications that consume trusted master data as part of business operations. This white paper will illustrate why ADM tools that have MDM features are better alternatives than pure-play MDM tools. The necessity to use both MDM concepts and ADM is explained in this paper using language as an analogy. In the 1990’s as organizations started to rollout applications such as ERP, SCM, APS and data warehousing, there was a need to define master data in each application. These definitions of master data such as products, customers, and suppliers are part of transactions and reports. Since there was no governance within the applications, poor master data prevented these applications from being utilized optimally. Additionally, there was no single source of truth for master data. By implementing MDM applications to build data hubs, data stewards believed that organizations would benefit from having a single source of truth for master data. This master data then is leveraged across all other IT initiatives of the organization that depended on master data to run their day to day transactions and reports. It was believed to be the logical solution to the problems resulting from poor master data. Unfortunately, many MDM customer surveys reported less-than-stellar results from such MDM projects. Organizations continued to have quality and trust issues concerning master data usage in their applications. Most of these MDM hubs become silos themselves, serving only a small subset of the enterprise application data needs. What is the explanation for this under-performance and disillusionment with MDM software? Wasn’t MDM supposed to be the panacea for all master data problems? What caused the poor ROI from these investments, despite starting out with promising business cases? Most importantly, what could be done differently to avoid failures with MDM initiatives? An inability to accurately articulate the real contribution of a well-designed MDM program and its role in Enterprise Information Management lies at the root of missed expectation and disappointment. To meet expectations from MDM buying decisions, all it takes is a little recalibration of the understanding of what a product/service can and should do. We will clarify this understanding using the language analogy. 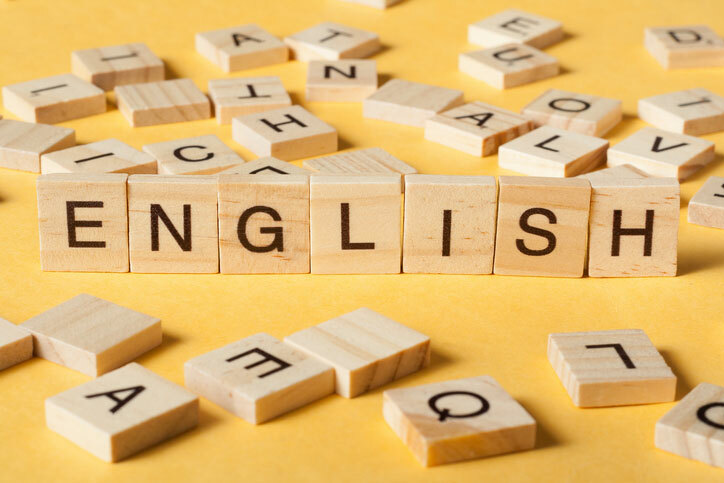 Language is a transformative power, the words we choose, the verbal expression of our ideas and feelings leave a powerful, lasting impression on both the speaker and the listener, the writer, and the reader. However, merely knowing the alphabet or words is not enough, since the goal of language is to help communicate higher-order thoughts, concepts, and ideas that lead to actions in the pursuit of common objectives. You achieve them when sentences are formed using the only afore-mentioned words, to convey unambiguous messages to the audience. According to Gartner, Master data management (MDM) is a technology-enabled discipline in which business and IT work together to ensure the uniformity, accuracy, stewardship, semantic consistency and accountability of the enterprise’s official shared master data assets. Master data is the consistent and uniform set of identifiers and extended attributes that describes the core entities of the enterprise including customers, prospects, citizens, suppliers, sites, hierarchies and chart of accounts. That which enables enterprise-wide communication amongst the different business units and functions without any ambiguity and concerns regarding information quality. MDM supplies the alphabets and words (master data is after all the nouns of the business) of this business language. Correctly implemented, the MDM system provides a single trusted source of correct business terms and meanings to be used within the various business processes executed by the Enterprise. MDM is the “Go to source” whenever there are conflicts about structure or meaning of any business concept and its intended usage. It is the dictionary of the Enterprise – the definitive guide to truth. Alphabets and words are the building blocks for communication. However, it is the user who applies rules of meaning and grammar to frame right sentences to use words in the appropriate context. The onus of using the building blocks appropriately and communicating the essence unambiguously is with the speaker/writer. Having an MDM hub with data that does not integrate in real time with 100% authorship, is akin to having just the alphabet and necessary words. Users have to apply impeccable grammar for meaningful, unambiguous sentences from these words. Selection of the Right Item by the Sales clerk as part of creating a Sales Order using Order Management form of an Execution system like ERP. When item definitions are loose, and a search shows many potential duplicates with similar/overlapping data values for other attributes associated with the item, the choice of the item becomes complicated. In terms of the language analogy - The item and the customer represent the “words” and the transactions represent the “sentences”. Rationalization of the Product Portfolio - A Business Unit Manager trying to decide on rationalizing the product portfolio has several decisions to make. How much did this product make and should I continue to make this product available to customers or make it obsolete or should I increase its price because its demand is high? In terms of the language analogy - The item and the customer represent the “words,” and the sentence analogy refers to the BI or operational reports that the manager uses to make the decision. These are the practical challenges business executives face every day. So, who or what mechanism can provide the missing capability of composing meaningful sentences? Application Data Management (ADM) tools are the solution to bridging this gap. A rough definition of ADM as per Gartner is “ADM hubs are those designed to manage semantic consistency of a wider range of data for a specific application or a suite of applications such that some local optimization is achieved”. 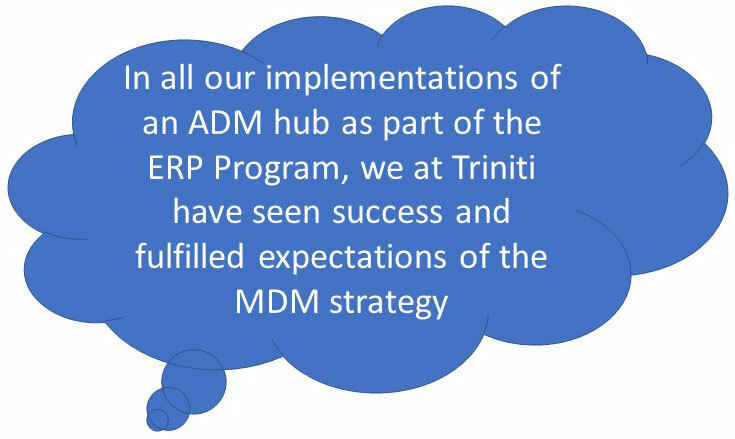 In all our implementations of an ADM hub as part of the ERP Program, we at Triniti have seen success and fulfilled expectations of the MDM strategy. Similar outcomes are also reported in case studies of other organizations where data is governed inside the applications. ADM Hubs are where consumers of master data – application systems such as ERP, CRM, SCM, HCM, Data Warehouses, etc., – have to supply the right transactional context. This enables downstream participants in the information processing supply chain to benefit from the good data. Imagine these application systems (ERP, CRM, SCM, HCM, Data Warehouses, etc.) to be a word processing document editor. ADM provides the spelling and grammar check utility to these document editors so that readers of the document can consume the content unambiguously. This is where the rubber meets the road. It is where value addition in the real business takes place. Thus, to gain real business benefits of rationalizing master data, executives have to realize that the transactional and other downstream reporting/analytics systems should be architected to work seamlessly with the master data. The need for someone or something to sit in the middle and try to transform or change the master data should be eliminated. This will ensure that the original and true meaning of master data can never be changed. MDM (alphabets and words) has little value in generating operational and BI reports if they contain incorrect master data in source application transactions. The clean transactions created through ADM represent unambiguous communication, in the language analogy. Miscommunication is the equivalent outcome without ADM. ETL tools and routines are often used to mitigate this problem. Unfortunately, delayed communication is as bad as poor communication and businesses that require timely data end up with low success with BI initiatives. Triniti’s ADM solution with exhaustive MDM features offers Excel-like simplicity and productivity, but with integrity checks and access control, so users can easily and quickly build a high-quality data source. Triniti Product Modeler (TPM), a combined ADM and MDM solution, provides ALL the foundational capabilities to support user-configured, workflow-based, governance of shared master data that could be rapidly deployed and mastered in the enterprise. Additionally, its data management framework provides a single platform to manage all data domains (Product, Customer, Supplier). Business and IT leaders must understand the need to rationalize their master data as a precursor to achieving ambitious business transformation. While evaluating candidate vendors and their solutions, they need to understand business requirements from all member applications for master data governance. Doing so would help them to critically assess and understand the critical technical capabilities of MDM solutions and the significance of ADM. This will enable them to make an informed decision regarding either choosing an MDM only partner or a partner that provides both MDM and ADM capabilities. Triniti customers have reaped the benefits of good data from using Trinti Product Modeler (TPM), a combined ADM and MDM solution. Executives who have decided to go with TPM have avoided the mishaps of an underperforming MDM program. They continue to enjoy immense business benefits! Call 866-531-9587 / Fill out the contact form to get a free consultation of Triniti MDM can be the solution to high quality master data.